There is nothing better this time of year, when the weather is starting to cool, than simple, hearty, homemade recipes that really warm you up. 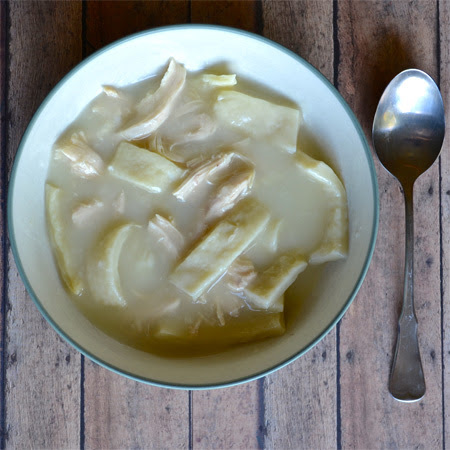 Growing up, I loved it when my mother would make this simple, family recipe for homemade chicken stock and noodles made from scratch. Poured over some starchy, mashed potatoes and it's the very definition of comfort food. What a joy it is to make simple, delicious fare for my own family now that I'm all grown up. This is a very straight forward recipe with few ingredients. It all starts with a stock-pot, salted water, chicken breasts (bone-in), some celery and an onion. You bring the chicken to a boil and then simmer until fully cooked. While the chicken is simmering, you can roll out your noodles and allow them to dry. You can even prep the noodles earlier in the day. Once the chicken is fully cooked, remove the onion and celery. Remove the chicken breasts and strip the meat from the chicken. Bring the broth to a boil, add the noodles and cook for about 10 mins. Add back in the stripped meat and thicken with some water and flour. Sprinkle in some chicken granules to boost the flavor. We like to thicken it enough that it takes on more of a gravy consistency. It's really wonderful poured over some mashed potatoes. 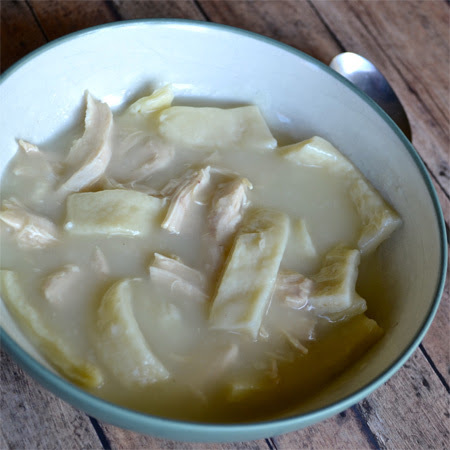 The texture of the potatoes is perfect with the noodles and tender chicken. 4-8 chicken breasts (bone-in) 4 chicken breasts feed 4 to 6 people. Place chicken in a stock pot. Pour in water just to cover the chicken breasts. Salt the water. Bring to a boil, add in celery and onion. Simmer for about 40 mins. 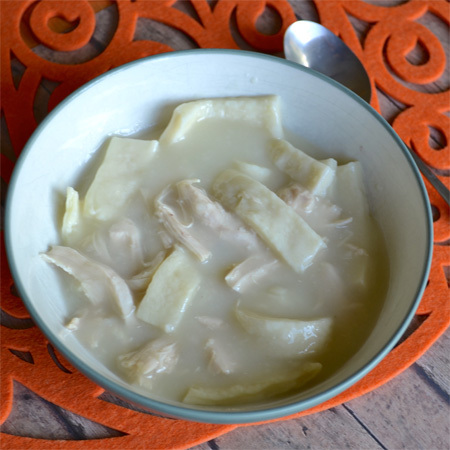 Set chicken aside to cool and remove pieces of celery and onion from broth. Remove chicken from bones. Discard any skin and bones. 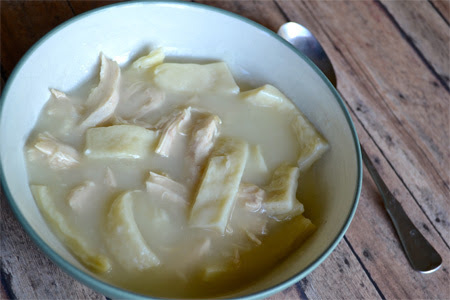 Cut chicken into bite sized pieces & reserve. While chicken is simmering beat together the eggs and salt. Then beat in flour until a very stiff dough is formed. Roll out on a floured board. 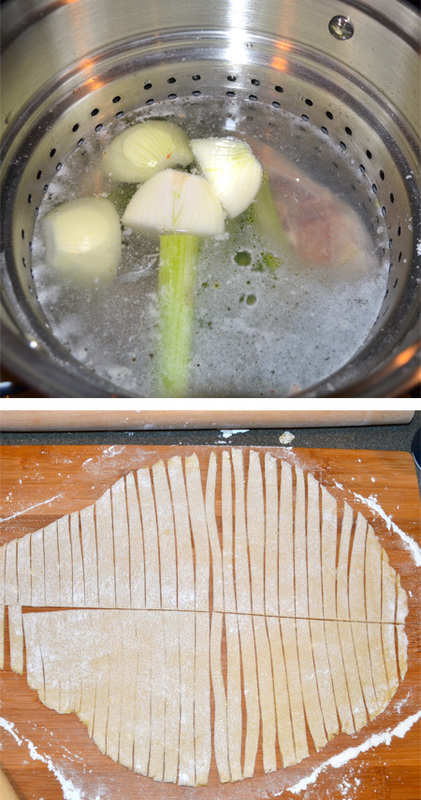 Cut noodles with a pizza cutter to desired size. Allow to dry on the board. Add noodles to the boiling broth and cook for about 10 minutes or until tender. 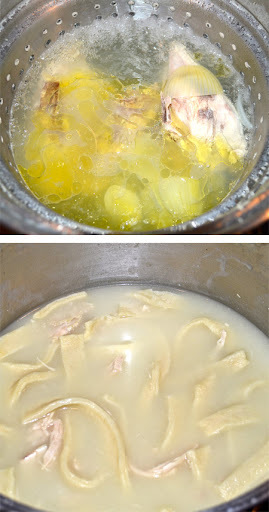 Add in the chicken pieces and a mixture of flour and water to thicken to desired consistency. Sprinkle in some chicken granules for added chicken flavor. Pour over mashed potatoes and enjoy.